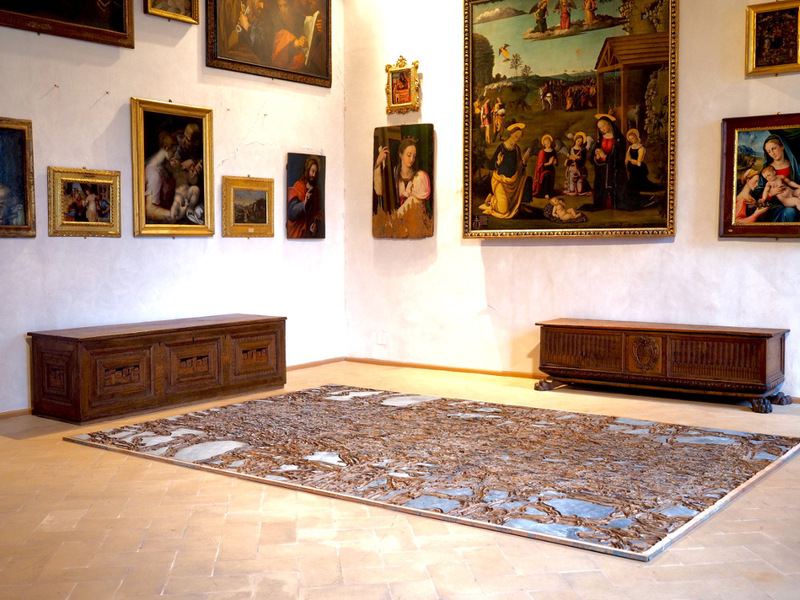 Art travels and you can travel with it … The exhibition Destruction for Creation by Soichiro Shimizu is a perfect example. 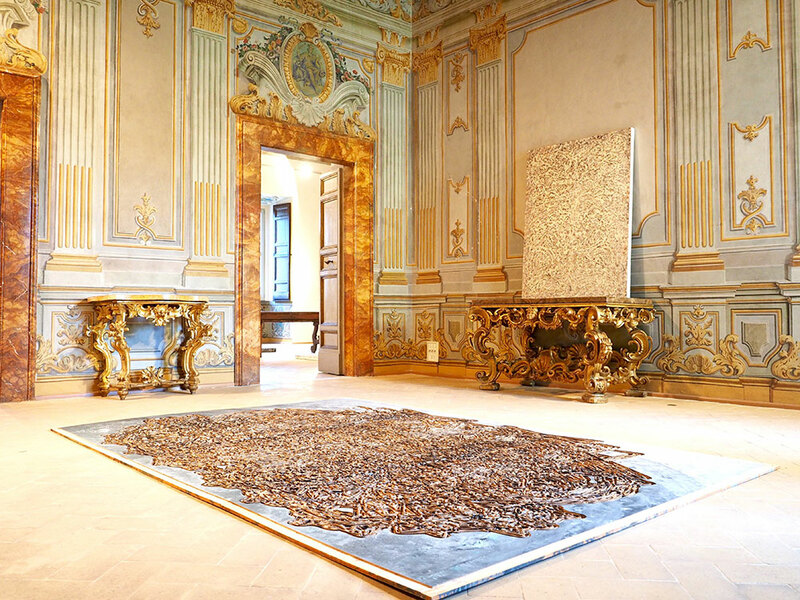 It is presented in Spoleto (Umbria), the artist is Japanese but lives in Bangkok and his work finds an incredible echo within this Italian Palazzo built at the beginning of the 18th century. This alchemy between times shows how universal is art. Captured by your emotions, you move forward from wonder to wonder. The exhibition itself is worth a visit but if you need a good excuse, a little getaway in Italy in May is always a good idea, isn’t it? Let’s start by setting the scene: Let’s make a quick stop in Rome for … « Faire une virée à deux, Tous les deux sur les chemins, Dans ton automobile, Tous les deux, on sera bien »* 🎶. First, you stay there for the weekend (seize the opportunity and enjoy!). And then, you swap the Vespa for a Fiat 500 and, after a nice two hour drive through the sweet landscapes of Italy, you arrive in the charming little village of Spoleto. It goes up and down, the streets are made of cobblestone, it is a little bit wonky, personally, I love it! 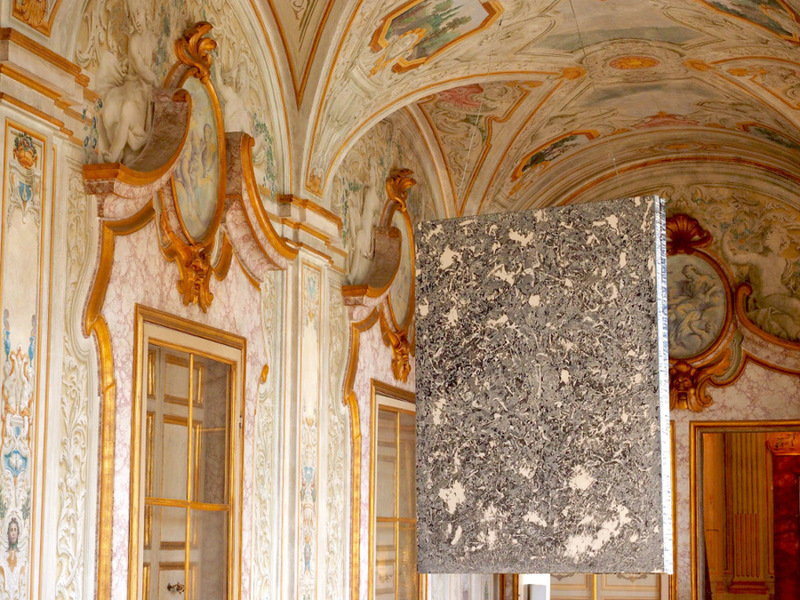 But don’t forget the main reason to go there: discovering a talented artist in an old Italian palace. 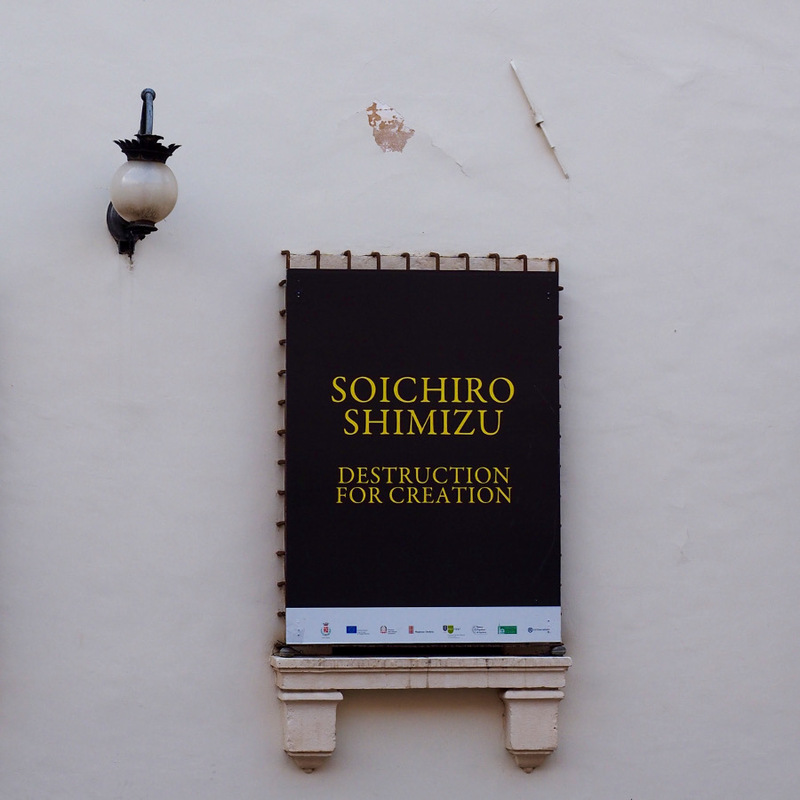 You have a Rendezvous at Palazzo Collicola Arti Visive to discover the exhibition Destruction for Creation by Soichiro Shimizu (until June 4, 2017). I am almost certain that you ask yourself: what can be so extraordinary in this little Italian village? A (slightly) hidden treasure. 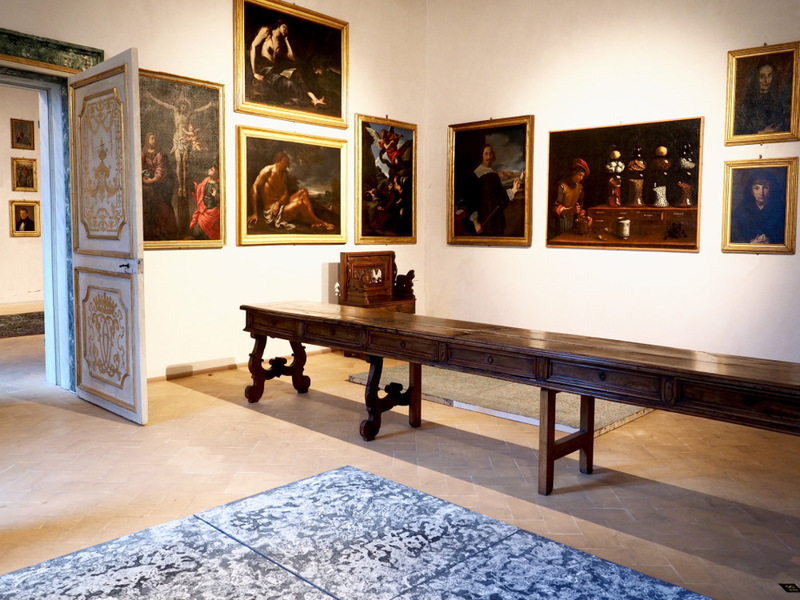 The director of this art palace, Gianluca Marziani, keeps the first floor of his museum for contemporary artists whose art pieces can create a dialogue with the original paintings, furniture and decoration already installed since centuries. This space is a sort of meeting place between art and time. 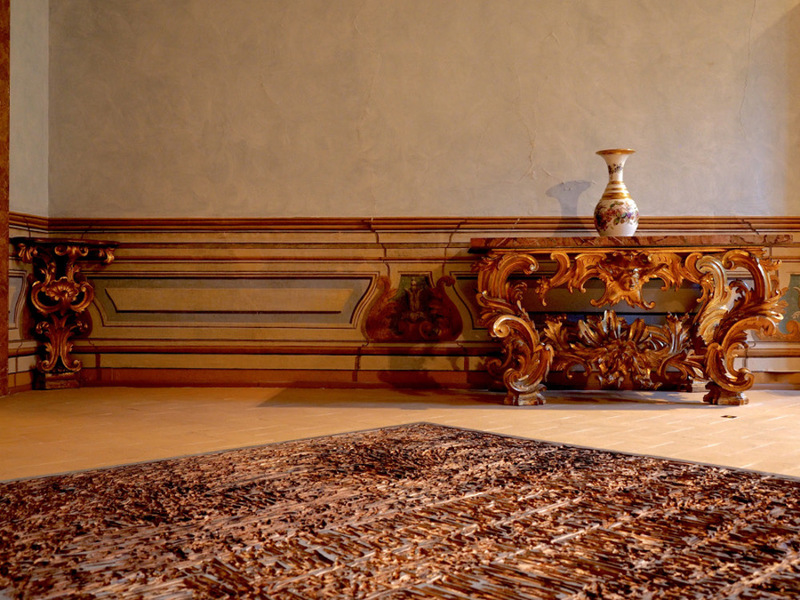 As the Château de Versailles, the Palazzo Collicola Arti Visive rose to the challenge of mixing styles (of different centuries) – and playing with the museographic codes because in these rooms, contemporary artwork is not hung on the walls, but laid out on the floor. A singular way of twisting art and especially the way of seeing it. This museum, where Italian and international artists (like Alexander Calder or Sol LeWitt) are gathered, displays at the moment a solo show of Soichiro Shimizu. 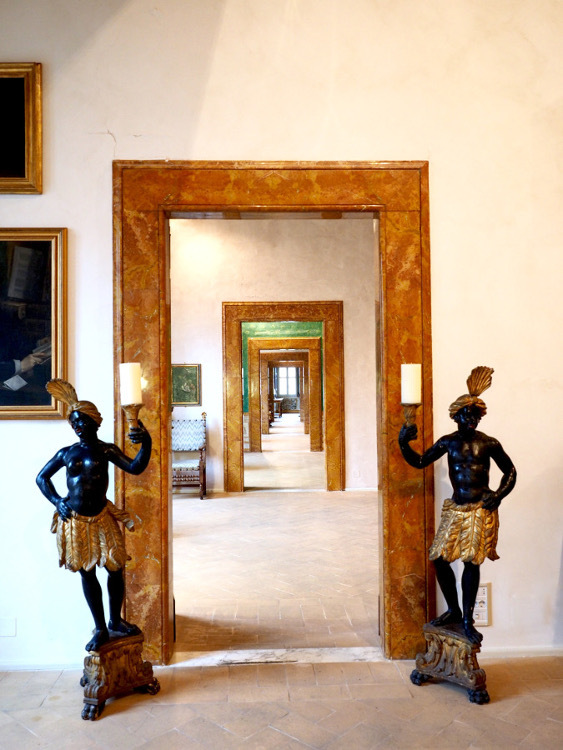 As if his work was created for this Palazzo, his art matches perfectly with the furniture, the frescoes, and the atmosphere of the palace. Magic overcomes you instantly and transports you out of time into a world where supreme beauty reigns. You might think that I’m exaggerating. But that is exactly what I felt. I did not want to leave, I went from one room to another, each time more curious to see what will be exhibited in the next one. Lots of surprises and emotions. Then I went back to see again some paintings that I particularly loved. I immersed myself in all this beauty to conserve a little piece of this magic within me. Obviously, this is very subjective, an art piece or an artist can be absolutely delightful or leave you completely indifferent – with all possible nuances in between. I hope the photos will give you a little impression to understand how Soichiro Shimizu’s work touches you. The exhibition Destruction for Creation gathers two techniques that the artist has experimented with during the last two years. 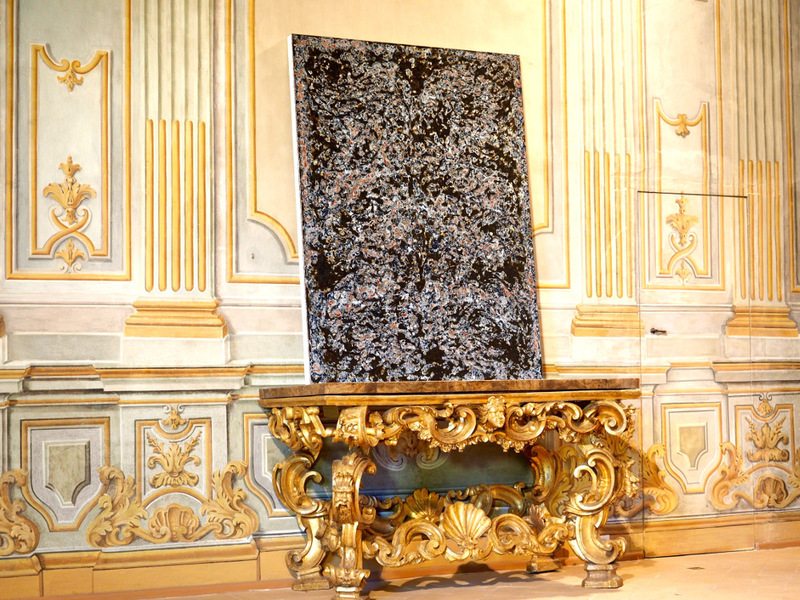 Both are based on an accumulation of layers of paint or wood. But more than that, the artist’s work is intrinsically linked to the idea of ​​destruction. This idea is achieved by destructing the different layers to create the final work. It is not in the “do” but into the “undo” that the art appears. The different thicknesses of the layers represent the ongoing time, like the rings of a tree which have to cope with the damage that humans cause to nature. Both series are about electromagnetic force, vortex, natural symmetry (which is approximate by definition) and perpetual motion. 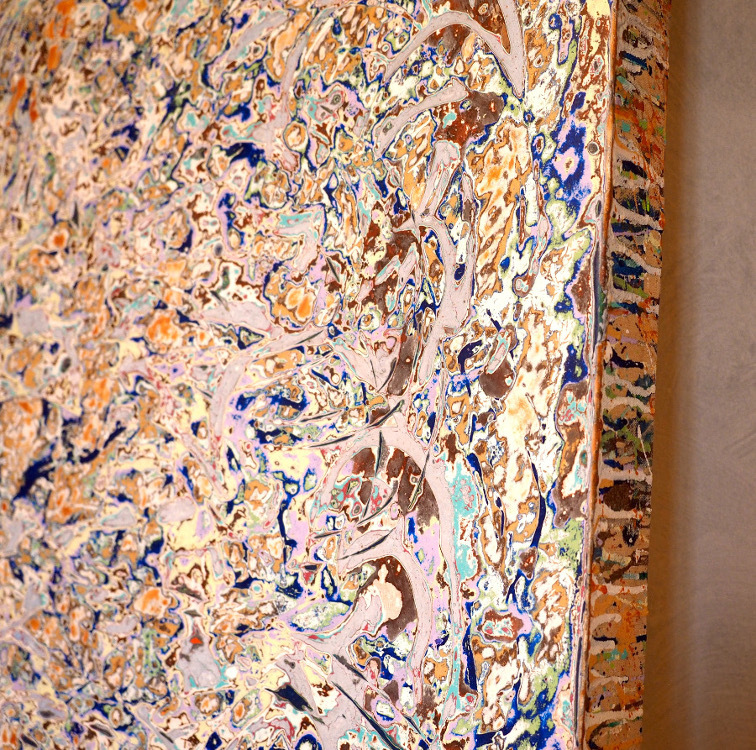 One is made of layers of wood and paint with an effect of concrete. They have been carved and then burned at specific spots. It is a metaphor of nature. The artist wants to show here that beauty can come out of scars or alterations endured by the nature which has a superior strength. The other series consists of numerous layers of paint which are sanded to reveal the different strata according to the location. 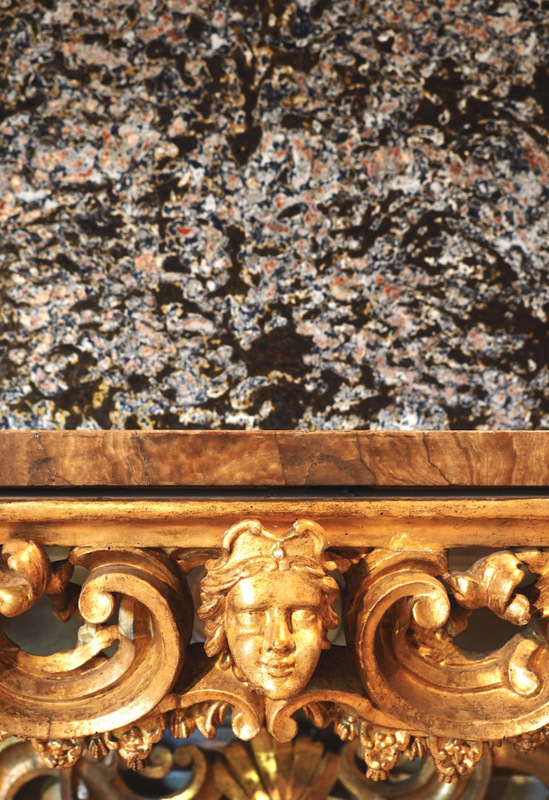 They create depth as some sort of marble, often very colorful. 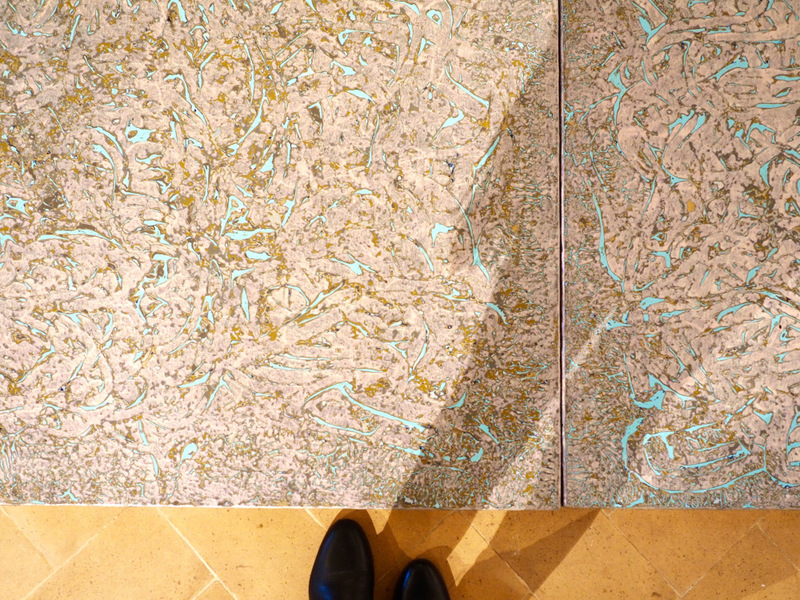 The smooth and shiny final surface is reminiscent of Japanese lacquers. The idea here is to highlight the erosion of time and the superposition of energies. He lived and worked in New York City for several years before settling in Bangkok, where he currently creates his works and loves to live. And I understand him very well. 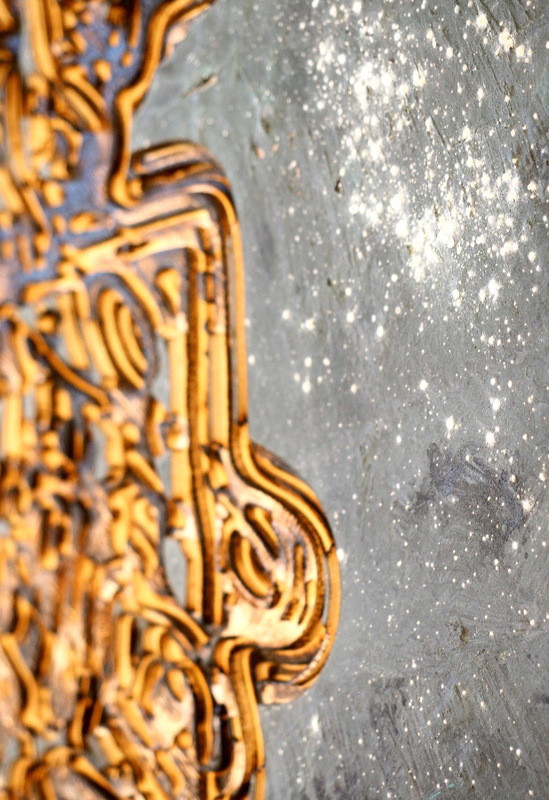 The capital of Thailand is abundant in ideas and creativity. It is an inspiring city in a marvelous country (would I be a Thailand fan? I absolutely do not know why you say that!). Soichiro Shimizu has a warm and respectful smile. His Japanese education is clearly visible; he shows restraint but has a sharp eye which see each single detail. He is a fine observer and lets his energy and feelings be fully expressed in his art. 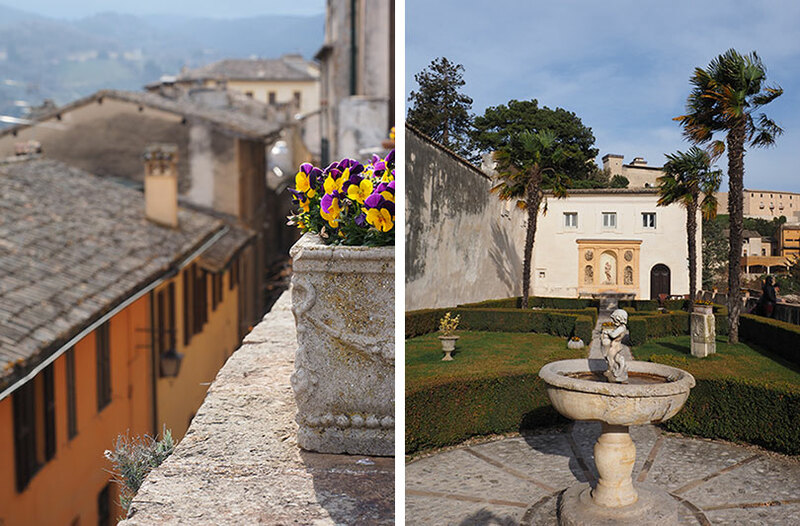 To stay in the same theme, book a room at Palazzo Leti – a charming hotel very well located in the village of Spoleto. It seems as time has stopped and the vintage decoration of this place makes it the perfect cocoon for this very nice break. If you have a bit more time, try to visit the region. The green heart of Italy (“cuor verde d’Italia”, nothing but that!) is absolutely amazing. You can eat very well (like everywhere in this divine country) and it is impossible to be bored in the birthplace of the Etruscan civilization and of Saint Francis of Assisi (Hello to all of the History lovers!). Are you looking already for a small place in your agenda? The feeling of having traveled and felt this little thrill of emotion when you see the art pieces? Beautiful write-up and stunning pictures! Would’ve loved to see it. Dear Mila, very intersting article and certainly it looks like a fantastic exhibition!